These days we’ve got two devices that make regular appearances on the rumor mill. HTC’s U12+ and Xiaomi’s Mi8 (and a potential Mi7) are both set to debut later this month. Courtesy of detailed leaks, little information is left to share for the HTC U12+ prior to its launch. However, despite concrete information for its specifications, prior to today, we have not witnessed a benchmark leak for the device. This changes today as the HTC U12+ makes its first appearance on GeekBench. Take a look below for more details. Despite not facing good fortunes in the flagship smartphone world of late, HTC isn’t ready to give up. News and leaks for the company’s U12+ are common these days. By the looks of things, the HTC U12+ will feature all the necessary specifications for a flagship smartphone and add some interesting improvements on top to differentiate it from other Android devices. The HTC U12+ will have the distinction of being a rare device with dual front and rear cameras. HTC will also remove the 3.5mm earphone jack from the smartphone. It will run on Qualcomm’s Snapdragon 845 and feature 6GB of RAM as the Taiwanese manufacturer chooses not to participate in the 8GB race initiated by OnePlus and Xiaomi. 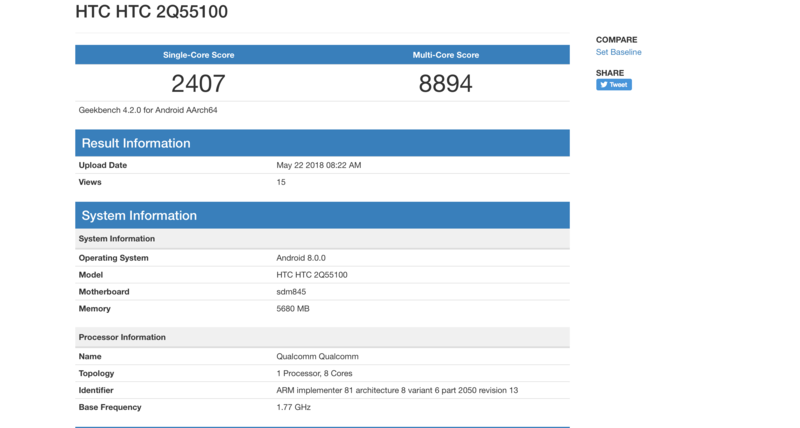 Today we’ve got the first and only GeekBench posting of the HTC 2Q55100. 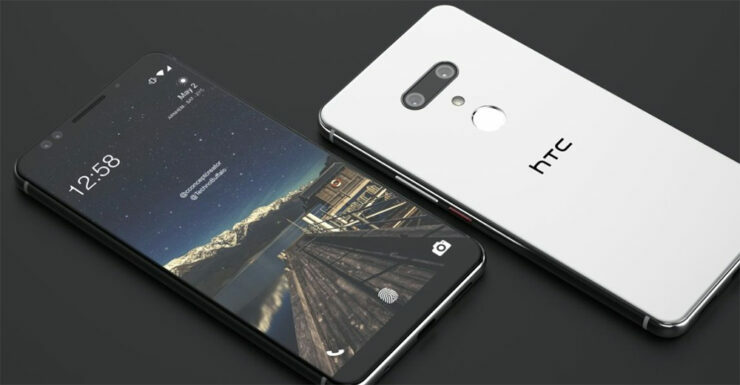 It’s the HTC U12+, as this codename has also surfaced in some earlier camera samples of the HTC U12+ that appeared on Google+. The device manages to score 2407 points in single and 8894 points in multi-core results. It runs on Qualcomm’s Snapdragon 845 with an approximate 6GB of RAM. However, it’s interesting to note that the Snapdragon 845 in today’s results is not running at full capacity. Therefore, it’s wise to consider that these results might not reflect the full spectrum of performance for the HTC U12+. These scores are also on par with other Android flagships for 2018. The Galaxy S9 for example scores around 2000 for single and 6500 for multi-core results. The Mix 2s, on the other hand, manages to bag around 2500 points for single and 9000 for multi-core results. Of course, since the HTC U12+’s GeekBench posting is before the device’s launch, don’t use it to reach concrete conclusions. Thoughts? Let us know what you think in the comments section below and stay tuned. We’ll keep you updated on the latest.